In Arahova, there is one place where you will be able to find the finest coffee and breakfast. That is here at Stou Ralli. 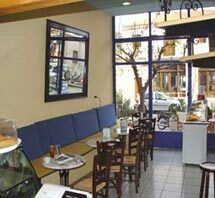 With a fine selection of coffees, juices, sweets, croisants, breakfast, honey and yogurt, sandwches and pies. We are open everyday from 6am, and on Saturday and Sunday, we are open all night, to serve you. We also operate as an internet cafe, so if you need to check your emails or suft the net, you will find all you need here with us.